HOLLYWOOD: The Studio Exec presents 5 True Facts from the Golden Age of Hollywood: 1. Humphrey Bogart. Fact 1: Humphrey Bogart was the last actor to win an Oscar who was born in the Nineteenth Century. Bogart was born Humphrey DeForest Bogart on Christmas Day in 1899. He won the Best Actor Oscar for his role in John Huston’s The African Queen in 1951 after having been nominated for Casablanca, but not winning. He would also be nominated for The Caine Mutiny but would again not win. Fact 2: Bogart began acting on the New York stage where he first made a name for himself playing hooray Henry roles in light comedies with titles like The Dancing Town and Cradle Snatchers. The line ‘Tennis, anyone?’ was made famous by Bogart, according to legend. It was a far cry from his later roles as a tough guy. But it wasn’t the movies which created the role but once more the theater. Having been in some risible films, Bogart returned to the theater in 1936 and made his breakthrough as the ruthless killer Duke Mantee in Robert Sherwood’s The Petrified Forest. Fact 3: Almost his whole career, Bogart can thank George Raft for his unerring lack of taste when it came to choosing projects. High Sierra, Raft turned down. For The Maltese Falcon and Casablanca, Bogart was often not only not the first choice but way down the list. His willingness to pick up projects and his hardworking ethic however saw him star in a series of hit films. But even for Sabrina Fair, with Bogie already a big star, he was still second pick after Cary Grant turned down the role. Fact 4: Bogart was the original Rat Pack, which Lauren Bacall named. Bogie and Bacall became one of the most iconic romantic partnerships of Hollywood history. They starred in three movies together and a TV version of The Petrified Forest. They were also the center of a social circle that Bacall dubbed the Rat Pack, which Frank Sinatra would popularize with a series of movies. Sinatra’s worship of Bogart probably had something to do with his pursuit of Bacall following Bogart’s death. This would even lead to a marriage proposal which never came off in the end. 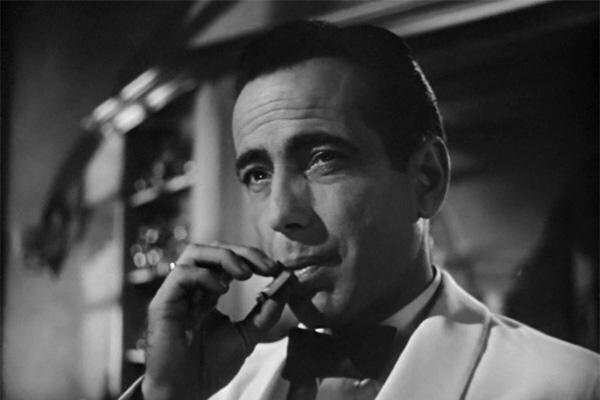 Fact 5: Bogart was plagued by health problems. He had a bad back, drank too much and smoked way too much. During the filming of Beat the Devil – a follow up to The Maltese Falcon – scripted by Truman Capote and directed by John Huston, Bogart had a car accident and knocked some teeth out. Unable to use the audio, Peter Sellers dubbed all of Bogart’s role. After his diagnosis with cancer, Bogart ended up too weak to walk and had the dumb waiter in his house modified so it could carry him downstairs where he could meet well-wishers such as Frank Sinatra and Spencer Tracey.